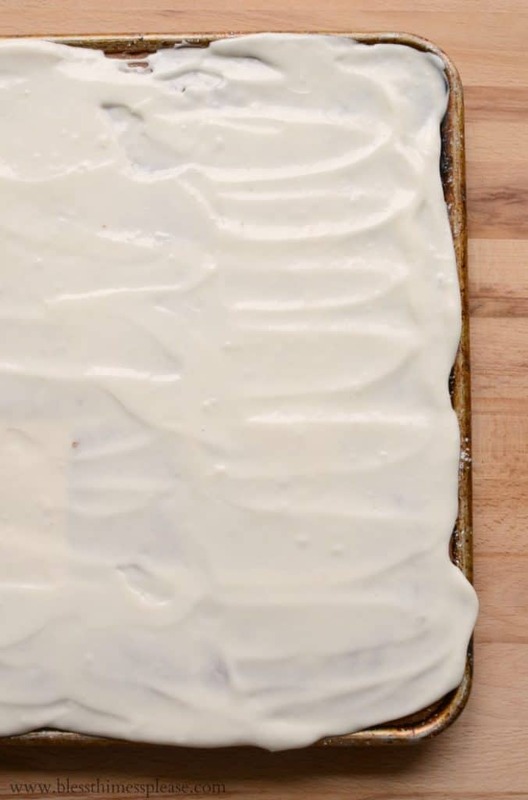 I’m a big fan of sheet cakes because they are pretty quick and easy to make, they bake quickly, they make a bunch (perfect for our big family dinners, parties, and church functions), and because the cake is thin, you can eat a big old square of it and not even feel bad about it. Today I’m sharing a fabulous recipe for Pumpkin Sheet Cake with a Simple Cream Icing. My love of sheet cake stems from my childhood in Indiana. My grandma made the most fabulous chocolate sheet cake and it’s very nostalgic for me (I just made that recipe on Sunday to celebrate birthdays in our family). That chocolate sheet cake is the one that I make over and over again, but every once in a while I like to try something new. 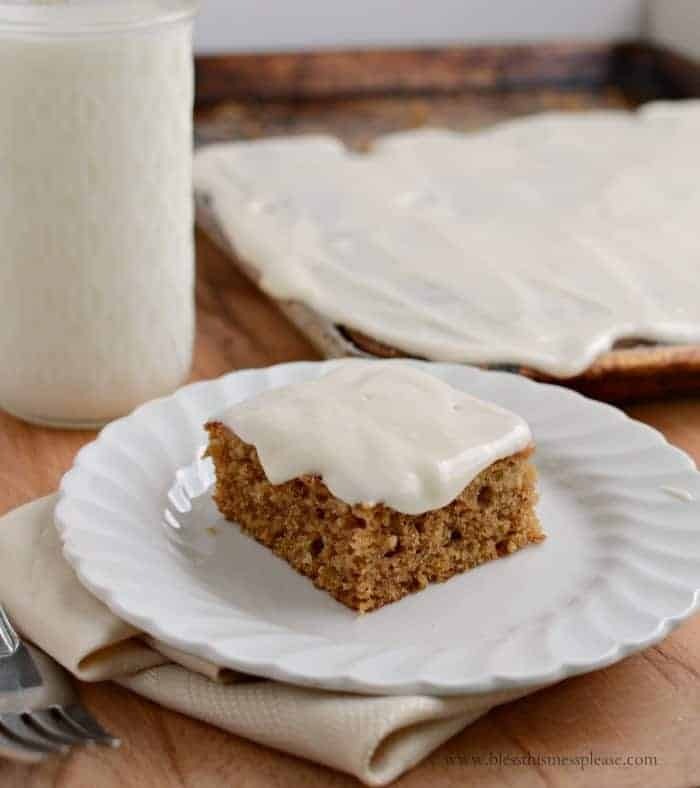 King Arthur Flour shared this pumpkin sheet cake recipe on their Facebook page and it was just calling my name. It turned out just perfect and I knew you all would like it too. Long live pumpkin season. I did a very simple cream icing and left it on thin side. I didn’t need a stiff buttercream icing because sheet cakes are casual and I didn’t mind if it was a little drippy and glossy. My icing was soft and just kind of settled into the cake nicely. If you’d like a stiffer icing, use a little more powdered sugar. The original recipe called for a cream cheese icing, which would also be fabulous on this cake. I like cream cheese icing on cinnamon rolls but it isn’t my favorite (I made too much of it when I was pregnant with Henry one day and I haven’t quite gotten back to liking it again). So if cream cheese icing is your jam, by all means, whip up a batch to compliment this tender, lightly spiced cake. Preheat the oven to 350 degrees and grease a large rimmed sheet cake pan (also called a Jelly Roll pan, should measure about 17 1/2 inches by 13 inches). In a medium bowl mix the oil, brown sugar, and granulated sugar together until well combined. Add the eggs, one at a time, incorporating well after each addition. Stir in the pumpkin puree and vanilla. Add the soda, baking powder, salt, pumpkin pie spice, and flour to the bowl and stir until the mixture just comes together. Pour the cake batter into the prepared pan and then bake until the cake is cooked through. You’ll start to smell the cake and the cake will spring back when touched lightly, about 15 minutes. Remove the cake from the oven and make the icing. To make the icing beat the butter, cream, vanilla, almond extract and 1 cup of the powdered sugar together on medium-high speed until the mixture comes together and is smooth, about 3 minutes. Add enough additional powdered sugar to make a moderately soft icing (it shouldn’t be runny but it will still spread really easily). Once the cake has cooked, spread the icing in a thin layer over the top. Serve at room temperature. 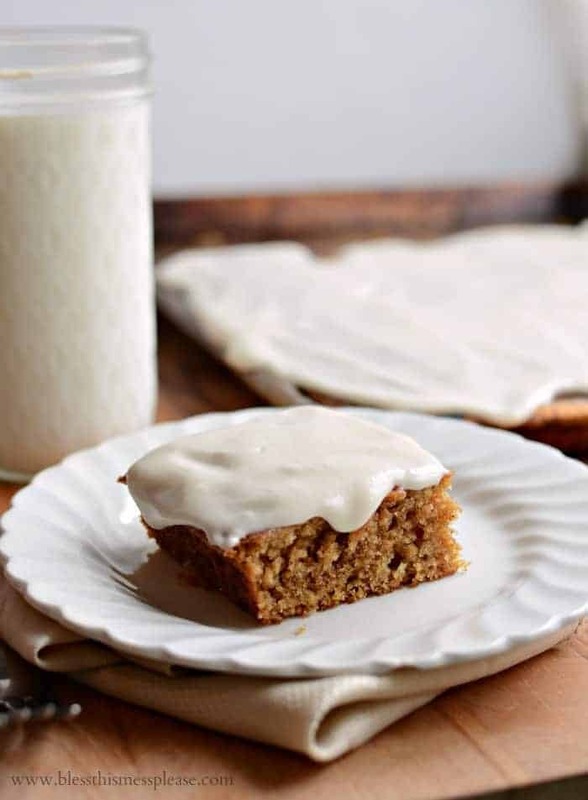 This pumpkin sheet cake recipe is adapted from and inspired by King Arthur Flour. I used well strained fresh pumpkin. We grew a whole bunch and I’ve actually already cooked every single one. I just pop them in my slow cooker, which really takes all of the work out of cooking fresh sugar pumpkins (read the full instructions here). It’s a great little kitchen tip to store away! A quick update on the kids: they are doing fabulous!!! It’s shocking how quickly a strong antibiotic ointment is working and I’m so grateful to be on the mend. Today is day 30 of someone in the house being sick which is just crazy. I think we’ll be pretty well healed up and ready to carry on with normal life on Monday, at least that’s my goal! Thanks for all your kind words and thoughts. They have helped so much! Have a great day and enjoy that cake! This looks awesome. Thanks so much, glad you are all on the mend. Thanks! Making this for the family! 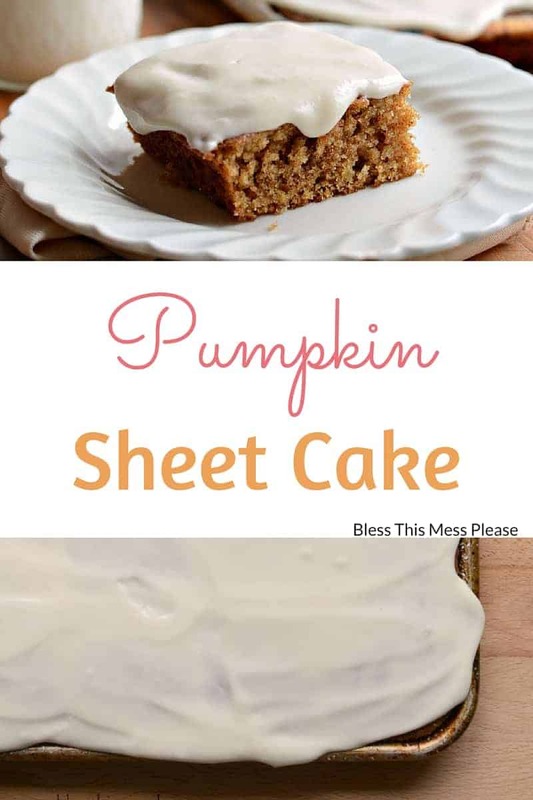 Why I’ve never made a sheet cake I have no idea, but this pumpkin sheet cake looks incredible!! I just have to try it! Love this recipe, Melissa! On my bucket list. A big cup of coffee and a plate full of pumpkin cake and I’m happy. Very confident in my ability to eat an entire one of these sheet cakes on my own. Probably in one sitting. Looks like pure perfection!